I am definitely not anti multiple choice. It's easy to grade, and sometimes students simply need to recognize information. When you want students to identify, multiple choice is fine. I just worry that in this day of overcrowded classrooms and standardized testing, many of us are over-using multiple choice at the expense of asking our students to reason. I am invested in the future of our nation as a citizen, obviously, so I am happy to pay school taxes long after my son graduates, but I want the free and public education that his children and their children receive to be a quality one. We're all paying for it, after all ;). We are the present, but the students that we teach today are the future, and I have every hope that our future will be a bright one. We obviously have to comply with the current bureaucratic, kill and drill, multiple choice climate of public education if we'd like to remain a part of it (and I feel a need to). So how do we work around it and teach our students to think, anyway? How do we do that and maintain our own family lives when we see upwards of 100 students everyday? 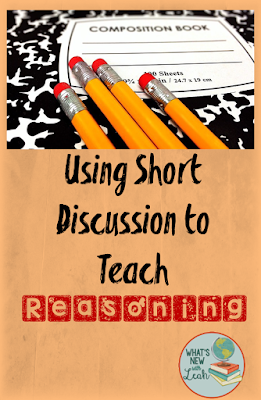 It is imperative that students develop the ability to reason and explain their reasoning. 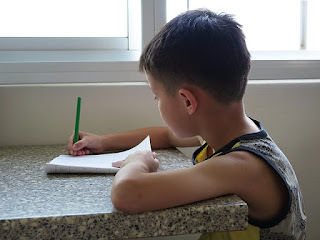 A strategy that I use with my struggling students (and it can be modified for students of various ability levels) is a short discussion question that students have to answer at the end of a brief lecture or introduction to a topic. The key to making these short discussions manageable (for me, anyway, on a consistent basis) is to require that they only be a paragraph. A paragraph isn't much to read, but it's enough space to allow students practice developing one idea and providing examples from the content to support their idea. 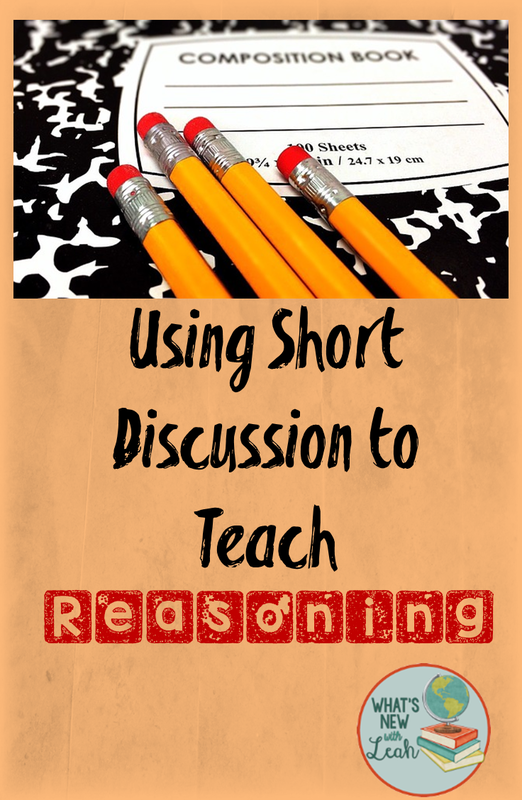 The question for the short discussion should ask the students to use the class content to reason, compare, analyze, discuss, connect, or argue. Here's a graphic organizer that I give students to help them organize their ideas and to encourage them to provide examples from the content they have learned in class. When students write their first short discussion, I read through them using this rubric. I assign a score to each one. Then I copy a 5, 4, 3, 2, and a 1 as examples (leaving out names and scores). I put students in groups of three, and have them read through the paragraphs, assign a score using the rubric for each, and explain in writing why they assigned each score. As a large group, we discuss the score each small group assigned each paragraph and they explain their reasoning. Amazingly enough, each score is remarkably similar to the one that I assigned the paragraphs. They then know what to expect the next time, and they are prepared to peer-edit (which I require them to do in pairs before they hand in each short discussion response). It's not a lot, and it doesn't take much class time, but the short discussion approach does help students to step outside of the multiple choice box and practice reasoning. It is vital that they do this. How do you help your students reason through the content? Leave a comment below and let me know! This is a great strategy for any subject area! I'd love to see some of the questions you ask for discussion!